Sushi is any dish that consists of vinegared rice (“sushi rice“) combined with other ingredients such as seafood and vegetables. When the sushi rice is wrapped in nori (seaweed) and rolled, it is a sushi roll. Sushi rolls or hosomaki are basic but popular sushi in Japan. Hoso means "thin" and maki means "roll." We say “thin” because there are also thick rolls, which are called futomaki. Due to the simplicity of ingredients and cooking technique, traditional edo-style sushi rolls, or hosomaki, consist of one main ingredient and are usually wrapped with nori on the outside. Hosomaki is suitable for home cooking as well as restaurant food. 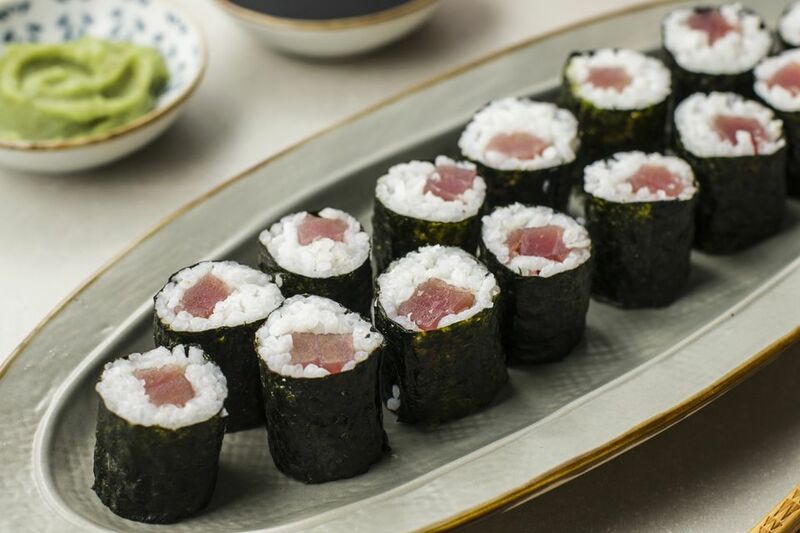 The two most popular hosomaki are tekkamaki, tuna rolls, and kappamaki, cucumber rolls. Tekkamaki uses raw tuna which has a pretty red color against white rice. The name Tekka, "hot iron," is said to come from this color. You only need a little bit of fish for each roll. Hosomaki are much easier to roll than thick sushi rolls, so they are perfect for practicing before you move on to sushi rolls like California Rolls and Dragon Rolls. You may need a couple times to practice to roll, but you’ll get the hang of it. We recommend you have extra rice and fillings to experiment and have fun making them. Cut the nori in half to 4-by-7 1/2 inches. Cut tuna into thin and long sticks 1/2-inch thick and 7 1/2-inch long. Roll up the bamboo mat, pressing forward to shape the sushi into a cylinder. Roll from the front end of the mat guiding with the sushi mat toward the other end. Tighten the rolls like roll cakes, pulling the mat to tighten, and pressing the bamboo mat firmly. Remove the roll from the mat. Repeat until all the rolls are made. Wipe a knife with a wet cloth before slicing sushi. Cut the rolled sushi into bite-size pieces. Serve right away with soy sauce and wasabi. Enjoy!